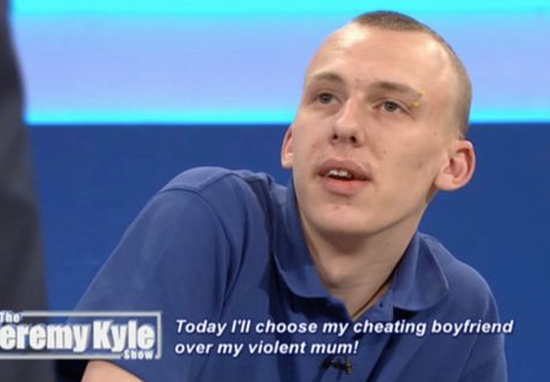 This guy could be facing jail after appearing on the Jeremy Kyle show and admitted to driving illegally. The Jeremy Kyle Show is known for featuring an assorted motley crew of people, often appearing with a plethora of disturbing problems. Believe it or not, it’s not actually that often a ‘guest’ admits criminal action on the show, but after Jeremy Kyle latched onto this unwanted fact, he had no choice but to confess. The whole awkward revelation came about, after Macauley was brought onto the show by his girlfriend Avril, along with his mum Paige, who she also claimed had been violent to her. Didn’t you drive without insurance, while you’d been banned? At this point Macauley was forced to answer him and for fear of lying to Jeremy, his mum, his girlfriend and the whole of the UK audience, he admitted he had. People like you should be thrown in jail! None of his relatives really seemed that bothered though, as his sister Kath retorted with a careless response. The usual drama you might expect to find on the show continued to unfold, as it was suddenly publicly revealed cheating Macauley and girlfriend Avril were in fact first cousins… A little unconventional, but legal at least. Driving without a licence is never OK though, under any circumstances, so hopefully this shock confession which could land him in prison will make him think twice in future.